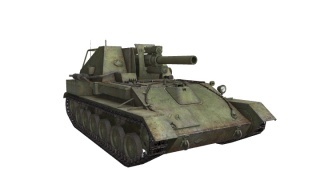 The SU-122A is a Soviet tier 5 self-propelled gun. Una AAP de 122 mm propuesta sobre la base del SU-76. No se construyó ningún prototipo. The SU-122A leads to the SU-8. Crucial top gun can seriously damage tier 7, and has an amazing 250mm HEAT round penetration. Quite poor accuracy and slow aim time on both guns. Occasionally misses fully aimed shots, but if it hits, it hurts. Almost a half minute to reload on top gun. Unstellar gun elevation and narrow gun traverse. SU-122A can be a fearsome arty with its 152 mm Howitzer D-1. 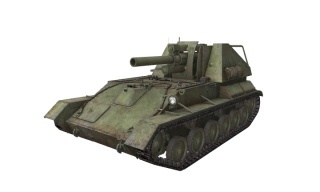 Technically if it hits any tier 5 or lower, it should be an instant kill, especially with its 250mm HEAT rounds loaded. It can also seriously damage 6s and 7s fully capable of one shotting a IS if you manage to set it on fire and he doesn't have a fire extinguisher. But the great gun has drawbacks in: aim time, reload time, accuracy and ammo capacity. The 152mm has almost 30s reload and 7s aim time, so make your shots count. 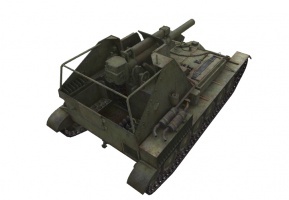 The stock 122 mm Howitzer M-30 can be good choice, as it reloads almost 2x faster and has more ammo, but has the same aim time, accuracy, and lower damage. Due to the tank's surprisingly okay top speed, acceleration, and traverse, combined with its compact size, this SPG has the potential to become a deadly ambush tank. However, you should only do this if you have you have plenty of team support to back up your long reload. Lastly this tanks elevation is bad. So you may need relocate a lot or learn the maps to know the best spot(s). Overall it can be difficult grind unless you're a confident arty player, however it gives a lot of basic experience for playing upper tier SPG's, and can be a good credit maker thanks to the high damage even against tier 7 heavies. Nothing carries over from the SU-5. First, research the SU-122A enhanced Suspension. 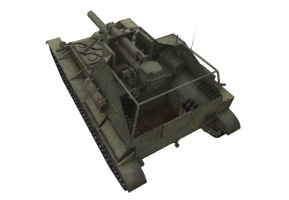 Next, research the 152 mm Howitzer D-1. Now, research the M-80 Engine. Finally, research the 12RT Radio. It is used on many other Soviet vehicles in a variety of different lines.